The fifth Fateclock Vanguard Championship concluded today with the only Ethics Buster cardfighter in the tournament topping first out of 81 participants. 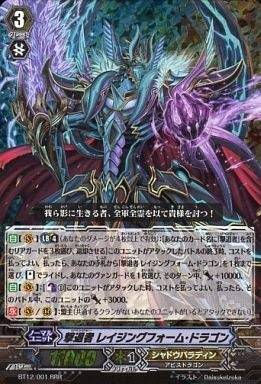 For the purposes of this VGCS, held on January 25th in Japan, the February 1st Fighter's Rules and accompanying restricted list were adopted prior to their effective date, providing a look into what the February-on format looks like. Although Kagerou and Genesis together accounted for 48 of the 81 decks entered, the top 4 still ended with two Nova Grappler cardfighters billed for first and second. Interestingly, the primary influence for these Nova Grappler decks seems to come from the 2013 junior national championships. CS champion "One Way Road" fought with a Beast Deity deck similar to Nagoya regional champion Muramatsu Masakiyo's (村松真聖) decklist, with an identical grade 3 lineup that takes advantage of the Beast Deity's shared support to make an amorphous strategy based around Ethics Buster that can either set up an eight attack combo using its Reverse card's limit break in combination with Buster's break ride skill or use Ethics Extreme to form an independent strategy even if the break ride is missed. 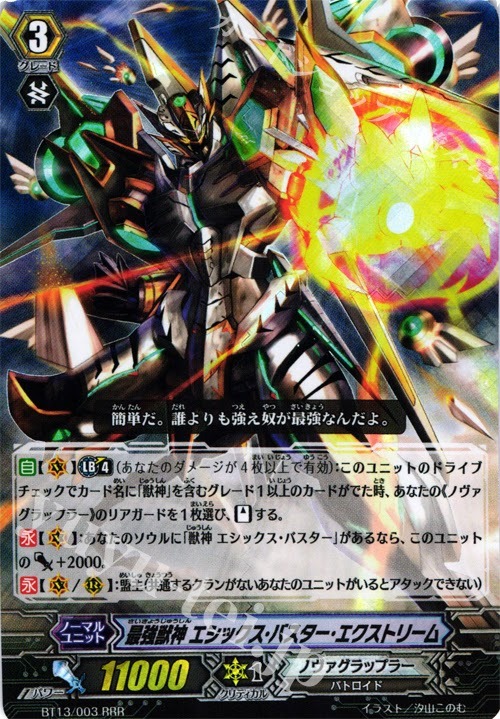 One Way Road's primary renovations were to run Street Bouncer and Energy Charger for cheap card advantage and Miraioh, the clan's generic grade 3 searching first vanguard, rather than Riot Horn as is more common. Meanwhile runner-up Ojima's Blaukluger deck drew inspiration from Nishida Sachi's (西田祥) Osaka decklist, using Galaxy and Mond Blaukluger in tandem with the Mars and Jupiter Blau series and 3 copies of the original Blaukluger for early game combos through low counterblast skills and damage unflipping. As in the official tournaments, some familiar names have cropped up as Gungnir has turned up on the radar once more, this time in fourth place with a Minerva-based Genesis deck rather than the Raging Form Dragon that first put him on the map, and Gaiji who some may remember from a previous Fateclock team tournament has likewise come up again right on Gungnir's heels. 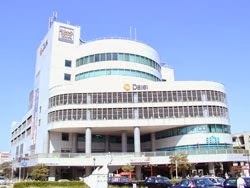 The fifth Fateclock VGCS was held in Hachiouji city's Kitano Civic Center and used a Swiss tournament ruleset with 5 rounds of Swiss draw and a 20 minute time limit followed by a cut to top 16. For the top 16, 50 minutes were allotted for best of 3 sets between each participant. Under these rules the tournament began at 11:15 AM and ended at 6:50 PM, with the awards ceremony finishing at 7:00 PM. The tournament's entry fee was 1000 yen, approximately $10 US, and the prize payout was a Nintendo 3DS XL for first place, second place a standard size 3DS, while third place received three boxes of VG-BT14: Brilliant Strike, fourth place two boxes of the same and the rest of the best 8 one box each. The system used by the tournament is similar to that previously tested at the West Tokyo VGCS, which has been employed since then in the majority of CS events. Of the participants, 23 fighters played Kagerou decks (13 of those based around Dragonic Nouvelle Vague and 10 of them on Dauntless Dominate Dragon "Яeverse"), 23 played Genesis, 8 Royal Paladin (1 Jewel Knight, 6 Sanctuary Guard Dragon and 1 Majesty Lord Blaster), 7 Link Joker, 6 Nova Grappler (5 based on the Blau series, with 1 Beast Deity deck), 5 Gold Paladin (3 Gancelot Zenith and 2 Ezel decks), 3 Shadow Paladin, 2 Narukami, 2 Pale Moon, 1 Dimension Police and 1 played Oracle Think Tank. The top 4 decks have been translated into English at the bottom of the page, and can be jumped to directly by searching the page for [5FVGCS]. 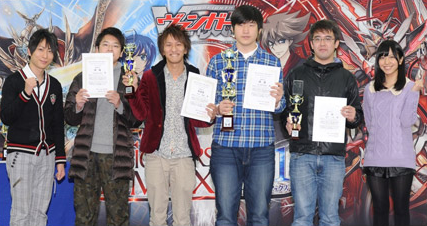 Lee Innyeng (center right) and Adachi Yuuki (center left) hold up the first and second place trophies. In other news, the FC2013 national championship decklists were unveiled through the Japanese Cardfight portal yesterday, revealing Lee Innyeng as the winter 2013 national champion. Lee achieved his position with a Revenger deck, based around the twin boss cards that have remained popular since their debut last July, Mordred Phantom and Raging Form Dragon. He is followed by Adachi Yuuki, Issei Sakashita and Hung Kai Chen in Japan's winter best 4, and is the first national champion to use the Shadow Paladin clan; his immediate predecessor, Kokubo Hikaru, played Pale Moon and was the cardfighter that first broke a two year chain of Royal Paladin dominance over the national title. Among the other developments since the previous national tournament, Sakashita's Gancelot build in third place and Hung's Minerva deck in fourth mark the first time that quintet walls have been used in pro decks, at a 1:3 ratio with their perfect defense cards. Quintet Walls are well liked for conserving cards expended from the hand when defending, using their counterblast 1 skill to put the top 5 cards of the deck onto the guardian circle, but can be difficult to manage in higher numbers with counterblast-heavy decks and conflict with perfect defense cards due to sharing the Sentinel keytext. On the surface, national champion Lee's deck is a very traditional Revenger deck. While other Shadow Paladin cardfighters have experimented with running Creeping Dark Goat as the first vanguard and Claudas as a Dark Bond target, and running 12 grade 3s at the sacrifice of grade 1 space is common to max out Tartu, Lee has done something more subtle with his construction. Instead of running Goat he chose to run two copies of Claudas, the Revengers' unique first vanguard, to create several favorable scenarios for the deck. Primarily this is being able to fetch two Blaster Dark Revengers without needing to rely on Mordred's break ride skill, using Dorin to conserve counterblast and Darkbond to fetch the second Claudas if it is not drawn. Since Dark Bond superior calls Claudas at rest, Shadow Paladin cardfighters have every incentive to immediately put Claudas into the soul with his skill to turn Dark Bond's otherwise serviceable +1 into an active rearguard able to declare an attack that turn. Having a second Claudas ready to come into play also helps deal with Linchu, Moebius Breath Dragon and Dust Tail Unicorn, common staples in the present format that counter Claudas by restricting how quickly he can be used as with Moebius or outright removing him with Linchu or Dust Tail into Chaos Breaker. The core elements of the deck are still the same field buildup with Mordred and Tartu that previous Revenger decks have rlied on, controlling the opponent's field with Dark Revenger and striking a finishing blow with Raging Form's self-stand skill, but Lee has refined it to make the deck run better than it did in Fighter's Road. Lee is the first Japanese champion to not be ethnically Japanese, born of Cambodian descent. Like the American and Luxembourgian world champions, Lee's achievement points to the globalization of Cardfight!! Vanguard as a competitive game and extends this even to within Japan, but also has deeper significance for everyday fighters in the country. Pro cardfighters in Japan primarily come from a Yamato Japanese background, leading to less visibility of minority ethnic groups in high level play. The FC2013 national decklists have been translated below, and can be jumped to directly by searching the page for [FC13OP]. x3 Deadliest Beast Deity, Ethics Buster "Яeverse"